It’s a big investment to transition over to a solar power system. 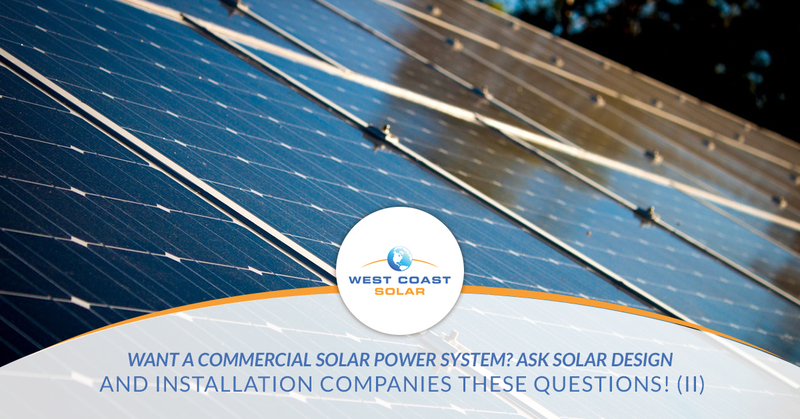 In the last post, West Coast Solar answered two major questions to get you started on your commercial solar power system. What’s next after you know how much it will cost and what’re the savings of having solar over fossil fuel based energy? Read on to find out in part two below! What are the main purchasing options for commercial solar power systems? A solar power system can be purchased similarly to a car. You can decide if purchasing outright, leasing, or even getting into a PPA with another company is right for you. Depending on your company’s financial situation and budget, there is an option right for you. The best course of action is to create a budget with available capital and work with a professional solar power installation company to make sure you get the system you need to fulfill your business’ needs. How do I know if my site is appropriate for a solar power system? A secondary conversation in person may need to occur to determine for sure whether or not your site is able to accommodate a solar power system. What size of solar power system will the business need? The type of panel or setup will be determined by space allotted or available for a solar power system. Something else to consider are wiring needs, permitting requirements, panel interconnection needs, and local ordinances. If you have enough space, you may want to consider investing in a larger supply of solar energy. In some cases, the power service provider may credit the business owner for producing enough energy so that they won’t need to purchase it from the provider. In other cases, storing excess energy may allow for your business to offer PPAs to other businesses, which can add a small revenue stream. Which products and supplies should be used for a commercial solar power system? Once again, it depends on the needs of the company. However, working with a solar power consultant or a reputable solar power system company can ease the anxiety and tension of learning the industry, making a substantial investment, and then managing it all on your own. How efficient are the various panels options being shown? How reliable are solar panel options? How durable are the offered solar panels? What is the overall lifespan of the offered solar panels system (s)? Can I scale the system being offered, if we need more energy? What kind of warranty is provided with the offered system(s)? These questions should give you a good idea on what type of system and company you’re dealing with to make the best choice. Want to get started on your solar power system design for your company? Give West Coast Solar a call for a quote today! Read part I of this series here, or part III to this series here.